This kayak trip is intended for those people interested in experiencing the awesome wilderness beauty of the 30,000 Islands of Lake Huron’s Georgian Bay, while learning more advanced kayak paddling skills and wilderness camping techniques. 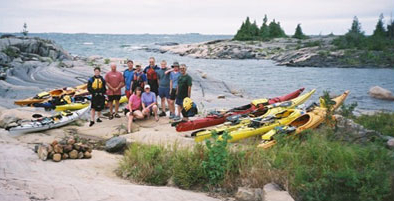 While enjoying the beauty of Georgian Bay, we will review basic map reading, compass and navigational skills; show how to plan a complete wilderness kayak trip, including how and where to find the best routes, maps, gear and ckecklists; see how to plan menus, prepare, store, cook and bake foods on a wilderness; prepare float plans, route plans, and emergency plans; select the best kayak packs, tents, sleeping bags, mattresses, stoves, cookware, tarps, saws and lighting; identify the best rain gear and clothing for wilderness kayaking, how to stay warm, dry and comfortable. We will camp on many of the beautiful islands of this wilderness archipelago. By the end of the trip you will have passed by more spectacular islands than you could possibly count and you will have had the adventure of a lifetime! A complete itinerary along with maps, clothing and equipment list, will be issued upon registration. Included: Transportation from the point of origin and return, camping fees, cooking gear, camp stoves, tents, meals, kayaks, paddles, life jackets, dry bags, tarps, major first aid supplies, emergency radio or satellite phone, and professional guides. Excluded: Transportation to point of origin, transfers, accommodation and food other than included in the itinerary, gratuities, and personal equipment. Meals: Beginning with lunch the Day 1 and ending with lunch on the last day. Day 0: Arrival in Toronto. Days 1-5: This is a fun, adventurous kayak trip is through some very beautiful wilderness areas in Canada’s Huron Lake/Georgian Bay waters. The exact route will depend on the weather and group ability but plans are to put-in at Britt in Byng Inlet, travel north, and take out at Hartly on the French River. Every opportunity will be taken to enjoy the wilderness setting, with time given to improving and learning new skills, free time for photography, swimming and general relaxation. Our trips generally are back in Toronto by 6:30 pm on the last day of the trip.